In a small bowl, mix garlic powder, cumin, coriander, smoked paprika, sea salt, pepper, and olive oil. Mix until combined. Rub mixture over both sides of the chicken. Heat a large skillet to medium high heat. Place chicken on skillet and cook each side for 4-6 minutes depending on thickness. You just want to make sure there is no pink in the middle. Remove and let rest. In the mean time, in a medium bowl add peach, red pepper, red onion, fresh cilantro, jalapeno, red wine vinegar, and salt. Mix together so everything is combined. 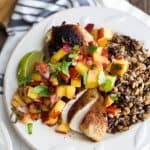 Slice chicken and top with peach salsa.